The early work of the pioneering feminist cartoonist plus her acclaimed new story “Dream House"
One of the most famous and idiosyncratic cartoonists of our time, Kominsky-Crumb traces her steps from a Beatles-loving fangirl, an East Village groupie, an adult grappling with her childhood, and a 1980s housewife and mother, to a new thirty-page story, “Dream House,” that looks back on her childhood forty years later. 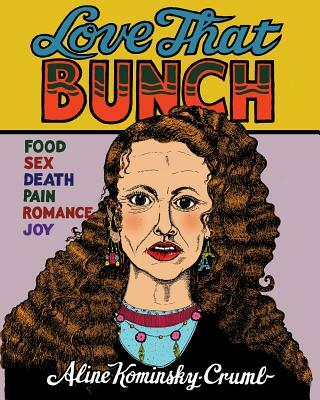 Love That Bunch will be Kominsky-Crumb’s only solo-authored book in print. Originally published as a book in 1990, this new expanded edition follows her to the present, including an afterword penned by the noted comics scholar Hillary Chute. Aline Kominsky-Crumb was born on Long Island, New York, and is one of the most influential cartoonists of the underground era as the cartoonist behind Dirty Laundry Comics and Arcade; a contributor to Wimmen’s Commix; cofounder of Twisted Sisters; editor of the anthology Weirdo; and author of the graphic memoir Need More Love. Since the 1990s, she has lived in the south of France with her husband, Robert Crumb. In 2017, the David Zwirner Gallery in New York City held a joint exhibition of their artwork: Aline Kominsky-Crumb & R. Crumb: Drawn Together.